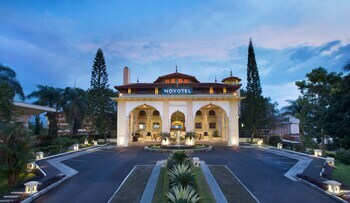 With a stay at Novotel Bukittinggi in Bukittinggi, you'll be a 2-minute walk from Jam Gadang and 7 minutes by foot from Taman Bundo Kanduang Park. Featured amenities include a 24-hour business center, express check-out, and dry cleaning/laundry services. Planning an event in Bukittinggi? This hotel has 10093 square feet (938 square meters) of space consisting of conference space and meeting rooms. With a stay at Airy Pecatu Indah Resort New Kuta Raya Uluwatu Bali in Pecatu (Kuta Selatan), you'll be within a 15-minute walk of New Kuta Green Park and Dreamland Beach. With a stay at Villa Puri Buri in Seminyak (Sunset Road), you'll be within a 15-minute drive of Seminyak Square and Eat Street. Free self parking is available onsite. With a stay at Airy Kuta Dewi Sartika Gang Nusa Indah 30 Bali in Kuta, you'll be a 4-minute drive from Tuban Beach and 6 minutes from Kuta Beach. Free self parking is available onsite.